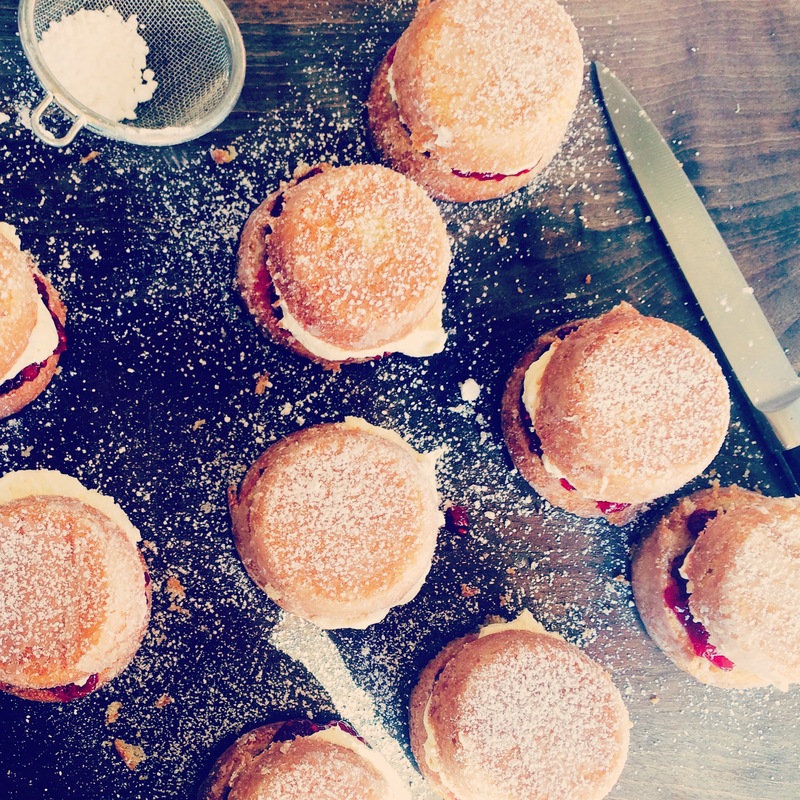 These mini Victoria sponges are so easy to make and are great for a party, or a vintage tea party…. 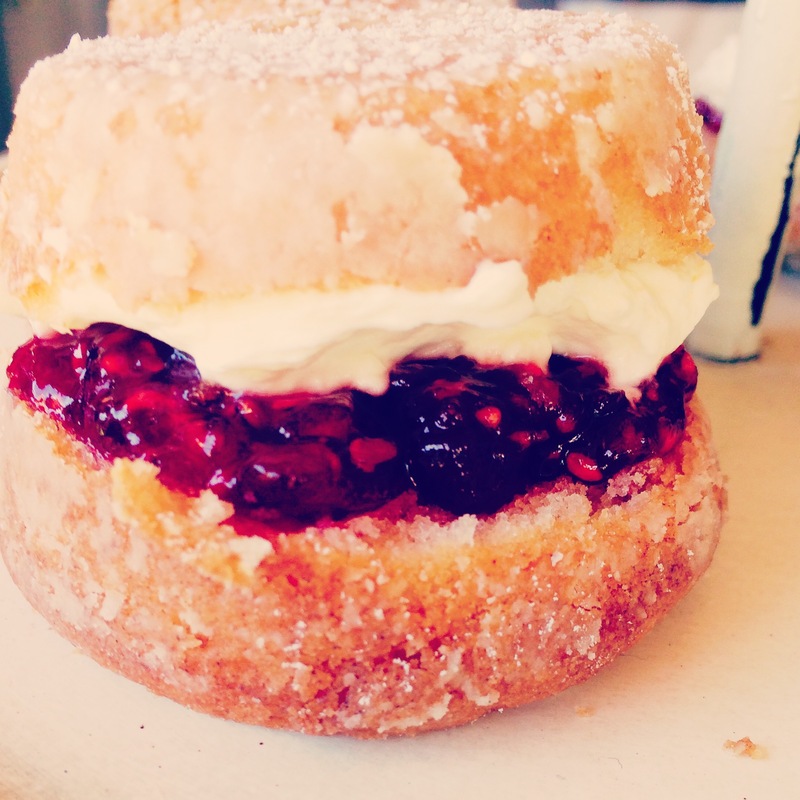 Whipped cream and jam for the filling. Rub butter into each hole in the muffin tray then sift over some flour, move and shake th tray around so every bit is covered in the flour then shake away any excess so you are left with a thin coating. This is instead of parchment to stop the cake sticking. Cream together the butter and sugar until pale in colour and fluffy. It should double in size too. Add the eggs a little at a time and continue to whisk, if it starts to curdle sprinkle in a little bit of the flour while whisking. Now you need to start to sieve in the flour, I do this gradually and from a height so the sponge is light, then fold it in rather than whisk. Makes the cake become more fluffy and light this way. Once all the flour is gently folded in you’re ready to bake. With 2 spoons carefully place even amounts into the muffin tray, do not fill them to the top as they will rise. Try to level each top too, ideally you want these mini cakes to be identical 🙂 You may not need too use all of the batter in one try, and could make another batch I made 18. Place in the oven for around 10-15 minutes, I cooked mine in 12 minutes. To check if it is cooked take a skewer and run it through the centre of a cake if it comes out clean it is done. Once cooked, they will have risen a little, this doesn’t matter as we will trim off the top. Let them cool a little in the tray them carefully remove and place onto a cooling rack. Now sieve some icing sugar onto a plate or a clean surface, and while the little cakes are still a little warm roll them in the sugar to give the cakes a vintage look. Once cooled trim the top to be flat and turn upside down, carefully cut the cakes into half, fill with the jam and the cream then pop the top on and give it another sprinkle of icing sugar. Rub butter into each hole in the muffin tray then sift over some flour, move and shake th tray around so every bit is covered in the flour then shake away any excess so you are left with a think coating. Now you need to start to sieve in the flour,I do this gradually and from a height so the sponge is light, then fold it in rather than whisk. I just think they become more fluffy and light this way. With 2 spoons carefully place even amounts into the muffin tray, do not fill them to the top as they will rise. Try to level each top too, ideally you want these mini cakes to be identical 🙂 You may not use all of the batter and could make another batch I made 18. Now sieve some icing sugar onto a plate or a clean surface, and while the little cakes are warm roll them in the sugar to give the cakes a vintage look.